How have housing issues impacted your life? It put my family in a predicament where…since we’re asthmatic we’re sick often, and due to the repairs that’s not done of lead poisoning we don’t know if we’re affected by it, or if we can be affected by it. When we lived in Bushwick, we lived in this 2-story building, and since our Land Lord used to live literally under us, our repairs were done faster than in the projects. At NYCHA they are procrastinators, so even if you continue to attack them, call 311, go to the section 8 office, they still procrastinate to do things. I grew up in Bushwick but a few years ago a new landlord bought my building and before we knew it, we got evicted so they could tear it down and build a new fancy building. Now I have to wake up at 5:30 am to commute from Harlem just to continue my education and spend time with my friends. Youth like me shouldn’t have to grow up with these problems. My father’s business is being taken away because of the gentrification in the area. They’re not continuing my father’s lease so he is forced to get a new job because now his job is gone. My house how…a lot of simple repairs in my home aren’t done fast enough, and even when they do fix things, they’re not fixed well. Rent is getting really, really high. We live in a rent controlled apartment, but it’s still getting harder, and then my dad is losing his business. It’s like, crashing, whatever. That I won’t be able to live here when I’m older and raise my kids. That my parents won’t be able to afford to live here anymore, because they’re going to get older and. It’s just going to get harder for me and my family. Why are you passionate about housing? I can’t avoid it. It’s in my personal life. My family has to deal with it, and my friends have to deal with it. I don’t like seeing people become homeless. It’s my morals. I care because it’s not fair to others. Everybody deserves to live in a nice home. At a point in time in my life my mom didn’t have a job, and money was really hard to come by and as the rent was getting raised higher and higher, there was a lot of times where I didn’t know where my next meal would come from, if I would get new clothes, if I would get a new asthma pump because I am also asthmatic. It was really scary to live in a place where you’re getting pushed out, you can’t afford these things, there wasn’t enough food to eat. Housing issues have affected my life very negatively. One day, if I can’t live here anymore, to come back and see no one that I know, every single restaurant that I’ve even been to in my childhood gone, no one from the original comm there to see, just the idea of everyone that i’ve known being pushed out, ever person of color who has worked hard to get a place, just gone. I don’t want people like me to have to worry about where their next meal is going to come from because the rent’s so high, because there’s always maintenance problems, because they’re getting pushed out of their homes. I don’t want another generation of children to have to worry about things like that. My name is Cat and I an a Youth Leader at CUFFH in Brooklyn. Let me start by saying that housing now is going way out of control and is really out of proportion when it comes to certain things. Since I live with my grandmother, our rent keeps getting higher and higher, and my grandparents aren’t really able to afford it. They’re constantly trying to look for other apartments that have cheaper rent, but there’s not really any “other rent-controlled apartments” that you can just find and be able to settle with a price that you can just keep stabilized. My biggest fear right now is not being able to become an older adult and continue to live my life in New York as I want it to be. This and not having the proper materials or the proper housing equipment that I need because of rent prices and how high they are. I am now fighting for three’ kids who live on the streets and need a home. Sometimes you gotta find them a home and sometimes it’s hard because not a lot of people care. so they’ll just be out on the street and we’ll look at them and think how they, not only need housing but how they really need an education. They’re our age and they really need an education, they’re standing out here on the streets with no parents or nothing. Kids like us who are on the streets deserve to have access t o a home. .
My name is Althea Miller. I moved to Flatbush, Brooklyn from Jamaica eight years ago. When I first arrived in Brooklyn, I was shocked. People live in these tiny apartments? I missed my house, and I missed the grass. But now, Flatbush is my home. I’m raising my son and my granddaughter in my rent stabilized apartment on Albermarle Road. I work at a fast food restaurant, and I was so proud when we won a higher minimum wage for all of New York State. Last year, the unthinkable happened. My sister died. My niece moved to Long Island. My landlord showed up at my door — I thought to offer condolences — but no. He said: It’s time to get out. My landlord told me that I didn’t have succession rights to my apartment. I never put my name on the lease, because I was waiting for immigration papers to come though, but it didn’t matter. He said if he got me out, he could raise the rents. Flatbush is now the center of gentrification in Brooklyn. He wanted me to go. I started learning my rights. I learned about the 20% vacancy bonus landlords get when someone moved out. I learned about the individual apartment improvement increases that landlords get when they convert 1 bedrooms into 2 bedrooms, or “renovate” rent stabilized apartments. I’m fighting back. I’m going to court. I organized a tenant association to fix things in my building, and to change the laws that work for landlords, not tenants. But I’m scared. I’m trying to prepare my son for the fact we might soon be homeless. He asks me “where are we going to go?” He’s 8. I don’t know what I will tell him. Weak rent regulations are driving me out of my home. If it weren’t for the vacancy bonus, I’d be able to stay. But my landlord wants one thing: profit. I’m afraid if nothing changes, he will get it — and I’ll be on the street. Governor Cuomo — you need to stand with us to end the vacancy bonus, and eliminate individual apartment increases. It’s time to stop standing with the real estate industry, and side with the tenants. My name is Karen Murray and I’ve been living with AIDS and I have been for years. Maybe if my life were different that would not. I was virally suppressed but have been inconsistent with taking my meds for about 5 to 6 years. Maybe it was around the time when I was homeless. Being homeless made me feel lost deep in my spirit, and I thought things would get better when I found a place of my own but depression didn’t stop. I live with bats, mice, sewage problems, leaky rooms, my ceiling leaks when my neighbor upstairs takes a shower. Sometimes I even think about taking a stray cat off the street and brining him in just to kill the mice. Some people ask why I don’t just move, but that takes money, and who has money and time to move to another place. Governor Cuomo, I wish you would invest in rental assistance and full funding for public housing so I could find a better place to live. No human being should live like this, especially when their health is on the line. My name is Romula Anglero; I live in Inwood with my three sons. For ten years we have been living in the same building, though things have changed dramatically since you came in office. It usually takes me an hour to get to my cleaning job, but with the current state of the trains, it takes me way more time now. Because of my low income, I had to ask for government assistance to make it through the end of the month. During the last few years, my rent has increased, and it has gotten harder and harder to pay for rent. A couple of times I struggled to make this payment, and the landlord took me to court. He is always trying to kick out his tenants. Things have gotten harder not only for us but everyone in my neighborhood. My community has changed dramatically over the last five years. Many people that used to live here have ended up moving to New Jersey or the Bronx, and so many stores have closed because of the rent hikes. Gentrification has taken over Inwood, and things keep getting worse for the working-class people who once lived here. You see new people living in the buildings, and you can tell that the landlords prefer them. Landlords have too much power now; they are looking into kicking us out and bringing people with money. This new type of tenant is the one they prefer; this is the people that you are working for Governor ––not for the working class. I have not only seen this change in my neighborhood; I now see so many people asking for money in the streets and sleeping in the subways. This wasn't happening before. This is not fair Governor. We hear you have invested in housing, but I haven't seen anything change for the better. We need affordable housing, if you have made any housing investments as you claim, the money has been directed somewhere else, but not to our communities. I can only hope I can stay in this apartment. If I have to find somewhere else to live, I don't know what I would do. I can barely make it until the end of the month; it would be impossible for me to get enough money for a down payment. Governor Cuomo, we need affordable housing, and we need rent laws to protect tenants. You need to serve the people that need it the most and stop favoring real estate investors. o, NY, in the Village of Akron. I am a resident of the Akron Mobile Home Park, now known as Akron Estates. I have lived in this community for 12 years with my husband Shawn and my 18-year-old son Jacob. Sunrise Capital Investors (SCI) purchased our community in November. As soon as this happened, our nightmare started. We received a new lease stating that our lot rent (monthly rent we pay for the land our homes sit on) will go up from $290 to $425 per month starting April 1st. On top of this, we have been threatened with eviction if we decide not to sign it. We’ve also seen the maintenance of our community fall through the cracks. Akron, like many upstate New York towns, receives a lot of snow during the winter months. SCI has done a terrible job keeping pathways clear, which has made many of the residents' slip and fall. We all mostly live on a fixed income in which case; if we succumb to the rent increase, we won't be able to eat or pay any bills. This increase will mean that 118 tenants in our park will pay $5100 a year for nothing other than the land their home sits on. Homeowners will be forced out of their own homes eventually. Due to the lack of inventory of affordable homes, we would have a hard time finding something close to where we call home to live. We also would not have enough time to sell our house and find a new place to live if they choose to throw us out on April 1st. Governor Cuomo, you need to implement real tenant and manufactured homeowner rights. We currently have very little protection. Without sufficient protections in place, many have had their economic and retirement security left in tatters, and even worse, many of us soon could end up homeless because of this. We need you to invest in housing quality and expand rent control protections so that our communities will no longer be preyed upon by unscrupulous and immoral real estate investors. My name is Maribeth Sheedy. I live in the suburbs of Buffalo, NY, in the Village of Akron. I am a resident of the Akron Mobile Home Park, now known as Akron Estates. I have lived in this community for 12 years with my husband Shawn and my 18-year-old son Jacob. Hempstead, Long Island: David L.
My name is David Lofton and I live in Hempstead, NY in a “rent-controlled” building. I have lived in my apartment for 5 years, and even though my building was supposed to have a $0 increase for this year, the landlord is increasing the rent anyway. A lot of people don't know the law, so people feel the need to either pay it or move. After a year or two, people end up moving out because they can’t afford to stay in the building. During the last 5 years I must have had a thousand problems, including the fact that my landlord has been trying to push me out of my apartment. For the 5 years that I've lived here, I have paid my rent a week in advance, but every month I get a late notice regardless. My landlord is constantly harassing me, trying to push me out and raise my rent. I pay exactly $1,200 a month but he is trying to raise it to over $2,000. I'm on a rent freeze, just like some of the people in the building who signed the petition we did in 2014. Whenever I see my landlord do anything illegal I write it up, just as I know he would do with me. I write it up and follow with the DHCR and let them know. But so many people in my building are afraid to step up, everybody wants to sit back and hide, they don't want to fight for themselves, they don't want to speak up. The State of New York and you, Governor Cuomo, are not doing anything to help us out at this time. I’ve lost a lot of sleep because of all the notices that my landlord sends me every time. My wife and I are retired –– I’m not sure we would be able to afford moving. Most of our salaries go to rent alone, we should have something to show for our money, and the only thing we ask for our money is a safe, decent, clean place to live. Governor Cuomo, you need to sit back and look what we are going through. You need to see how the majority of the people who voted for you are living. We need real regulations that can support tenants from predatory landlords. Most of us have to work two to three jobs to afford to put a roof over our head. This situation is not fair for anyone. You need to do a better job for us, Governor: invest in code enforcement and housing quality in New York State’s 2018 budget. My name is Pedro and I've lived in Rochester, NY for 22 years this upcoming June. Since I've been here so long and have Section 8, you would think I have stable housing and live in a nice apartment in a nice neighborhood. But instead I've been living with mold and mice, and I've gotten bed bugs twice. My apartment is in the back of the building and when it gets cold, I get all the cold from both sides. To make matters worse, I don't control the heat in my apartment. A few weeks ago, it got so cold that I couldn't stay in my apartment since I can't control the heat. I had to go over to a friend's apartment. I don't stay in my apartment much, because while I'm HIV-positive and it's not an issue for me, my other chronic illnesses are. I have to protect myself when conditions don't allow me to stay in my own apartment. Governor Cuomo, this is a big crisis upstate. The housing crisis is nothing short of crazy. We need rental assistance to have adequate housing or else many New Yorkers will end up homeless. I was living in chronic homelessness and through advocacy I'm in a different place today, but many New Yorkers are living in insecure and risky situations that could cost them their health. We need real solutions to this housing crisis starting now, Governor Cuomo. Gloria Tellez-Tovar lives in a rent stabilized building for more than 20yrs. Her building is probably one of the few rent stabilized buildings that still exist in Bushwick. When her parents migrated from Mexico years ago they moved a lot, even back then it was very hard to find a place to live. Her daughter has been in Bushwick her whole life, they love their neighborhood but feel how it's changing slowly. A lot of people who used to live there haven been forced out. They had no other choice after their rents increased to a point where they could no longer afford to stay. Public schools are dropping in enrollments and charters are starting to pop up, buildings are being renovated and prices are beyond of what people can afford. For Gloria, It has got out of control. 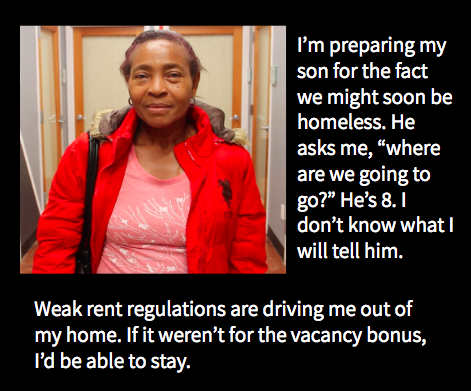 Gloria doesn’t know how long her building will stay rent stabilized, though she suspects maybe until the landlord decides to sell it or finds a way to deem it unsafe to live. “Where would we go if we have have been living there for 20 years?”, she says. The rent will increase and they don't have the means to be traveling elsewhere. Gloria can't work at the moment because she’s still recovering from an illness. When she first got sick, she started having trouble paying rent on time and was taken to court. The whole court process and trying to prevent an eviction prompted her to ask about resources for low income people. She is now actively trying to inform others about their rights and helping them get the repairs they desperately need. At the rate how the neighborhood is changing, she doesn’t know how long she’ll be able to keep her apartment. The fear of gentrification is surreal, for now she’s able to stay and fight nonstop in court to get her apartment fixed. If Gloria would have to move, she would have to go far from Bushwick because it's impossible for her to stay with the current prices. “I can't even imagine what would happen to those who are elderly or disable and have a fix income, where are they supposed to go? With so much development going on around the area, they are thinking more about condominiums and not in senior centers and deep affordable housing”, she says. Even with affordable housing they say people we don’t qualify simply because they don’t have the Credit score to match their criteria. “After 20 wonderful years living in this neighborhood, the place that has seen me grow and create a family of my own, I see myself with one foot out the door because Governor Cuomo failed to address the housing crisis. Rents are increasing everywhere, and we can only dream for regulations that would allow tenants like me to hold our landlords accountable” Gloria states. The state needs to audit these landlords to see if they are in fact filing the right paperwork and giving the residents a chance regardless of immigration, financial status or vouchers they hold. We need Governor Cuomo to stand up for immigrant families and people of color who are struggling, and who deserve the right to housing. We need strengthened and expanded tenants’ rights across New York State, plus investment in code enforcement and housing quality in New York State’s 2018 budget. When my husband Joel and I moved to New Paltz 11 years ago to be closer to our daughter and her family, we had a hard time finding a rental in our budget. I started developing vision issues in 2000 and was unable to work from then on. My husband Joel retired at 65 after having knee surgery, and neither of us were provided 401K plans or pensions through our employers. We rely solely on Social Security for monthly income so when we moved it was hard to rent within our budget, but we really wanted a place of our own. After searching for a while, we found a great house for us in a manufactured home community on the west side of town. It was a perfect setup for us –– we could own our home and just rent the land that it sits on. A house in a manufactured home community has been a wonderful option for us. We have a tight-knit community, our home is on one level so it’s easy for my husband and I to move around, and we get to tend to our yard in the warmer months. It hasn’t all been sunshine and roses, though. While our home continues to depreciate due to the stigma of owning a manufactured home, we still have to deal with all the other payments we have that make our house a home, including utilities and garbage disposal –– none of which is included in the rent for our lot. We’re on a fixed income so it’s hard for us to get by month after month. Governor Cuomo, we need real rental solutions for people on fixed incomes, people with disabilities, and families who rent month-to-month in manufactured home communities. How are families across the state expected to make ends meet when housing costs are chewing up so much of people’s take home pay? Hear us out, Governor: protect vulnerable tenants today with stronger rent protections and affordable housing. My name is GG, and I’m homeless. I live in a women’s shelter in Harlem NY and have been homeless for a year and a half now. I’ve been looking for an apartment but haven't been able to find anything that’s affordable, along with thousands of other New Yorkers that are living in shelters. I believe you're failing us because you're putting real estate developers over vulnerable New Yorkers. We need rental assistance and supportive housing so the thousands of New Yorkers living in shelters can go into permanent housing. I also feel like housing is a human right, it’s not a luxury and every New Yorker deserves a home. We shouldn’t have to be kicked out of our state, priced out of our neighborhoods, or forced out of our buildings to go to another city. We are New Yorkers. We don’t want to go and live in another city. We shouldn’t have to leave our city to be able to afford to live. Governor Cuomo, you MUST invest in housing now to fix this crisis. I recently faced every renter’s worst nightmare — eviction. Almost three years ago, I was living in what seemed like an endless cycle of tenant harassment, unjust police intervention, and debt. I live in the Village of Hempstead on Long Island, an area where police are constantly targeting low-income residents of color. I was unjustly arrested in my home and had to pay bail; I live on a fixed income and have a young son, so the choice for me was clear: do I pay the bond to get out of jail, or do I pay my rent? Low-income tenants in Black and brown communities, where police abuse their power and landlords harass us, are constantly forced to make choices like this. Governor Cuomo, no one should have to make a choice like that just to survive. After this incident, my landlord was hell-bent on evicting me from my apartment in order to do renovations. He wanted to put me on the street just so he could raise the rent for that apartment. My story is just one of many where tenants are facing similar situations with housing -- abusive landlords, rent hikes, and barely any legal protections. Shamefully, this is why there are 89,000 homeless people in New York State. Who is responsible for this housing crisis? You are, Governor Cuomo. After 7 years in office, you've failed to strengthen protections for New York tenants. It's time for you to stand with tenants, starting with strengthening the rent laws. Governor Cuomo, take a walk in our shoes for just 90 days and see how we live. Get one of these apartments and see what's going on with the housing crisis firsthand. New Yorkers will continue to make our voices heard, and we are going to hold you accountable. My name is Helen. I am a part-time home health aide and I live in downtown Kingston with my five beautiful children. In 2015, I was evicted and had to move temporarily to live with family in Syracuse. But Kingston is my home. I took time to find a new place in Kingston, where my children are happy and where they go to school. It took me so long to find a habitable apartment that I could afford -- even with my Section 8 voucher. On top of monthly rent payments, landlords demand move-in fees and other monthly fees. Kingston is now one of the most unaffordable places in New York State. Homelessness has increased in my City, and more and more families are paying more than 30% of their income in rent. After a long search I landed in our current apartment -- a three bedroom in a three-family house. I’m only able to pay the $1125 month in rent with the help of Section 8. But the apartment is in bad shape. This winter it got so cold that the pipes in our apartment froze. I did what anyone would do: I called my landlord. He refused to fix the pipes. Our home was temporarily condemned. I had no choice but to move move my family to a motel in Highland, New York -- 30 minutes outside of Kingston. I have an old car that helps me get around but is in need of repair. But while living in the motel, small tasks like getting my kids to school became nearly impossible. I had to choose between getting them to school or getting myself to work -- between their education or a roof over their head. This is a choice no parent should have to make. My landlord eventually purchased electric heaters to warm up the pipe -- this more than doubled my February electric bill. My apartment continues to have a significant mold problem in almost every room. My five children and neighbors breathe moldy air, day in and day out. My landlord refuses to make repairs, and even with Section 8, this is the only housing I can afford. More and more people like me are struggling across New York State as your administration has failed to address the housing crisis. Homelessness has skyrocketed to over 89,000 homeless New Yorkers. Rents are increasing everywhere. There are no regulations that allow tenants like me to hold my landlord accountable. Governor Cuomo: do the right thing. Stand up for families like mine. 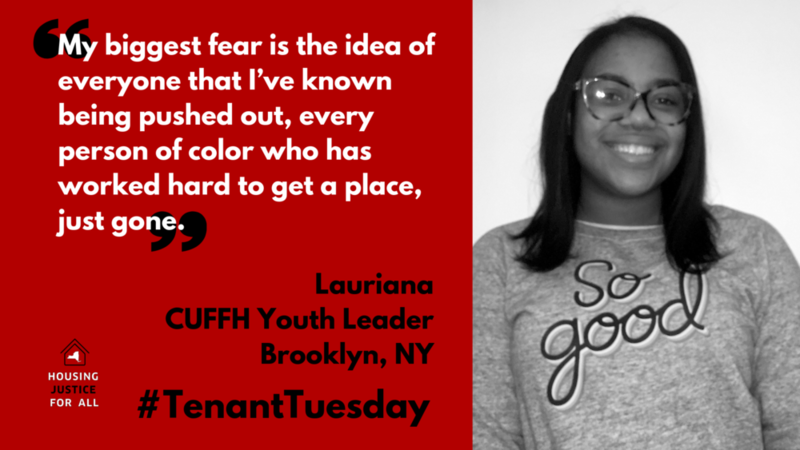 It’s not just New York City tenants who are struggling, and who deserve the right to a renewal lease. You must strengthen and expand tenants’ rights across New York State, and invest in code enforcement and housing quality in New York State’s 2018 budget.